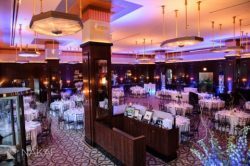 For a beautiful, luxurious event venue in one of Chicago’s best neighborhoods, The Montgomery Club is an excellent choice. The Montgomery Club is located in River North, and is part of the Gibsons Restaurant Group. With these two things combined, you are guaranteed to have a unique, Chicago dining experience. The private dining rooms at The Montgomery Club each offer their own, unique experiences. For a bigger event (like a wedding reception), the Superior Room is the perfect choice. For a smaller, more intimate summer gathering, the outdoor bar and patio may be the right selection for your needs. If you are looking for a gorgeous event space with top tier dining options, The Montgomery Club is the right choice for you.